If one looks at the surface of the conflict today, the Mideast crisis is a conflict or struggle between Palestine and Israel. We are told that the Palesinian-Israeli conflict and struggle constitutes the source of all evil and only its resolution will lead to regional peace and stability. In modern political /nationalist terms, it appears as a struggle between two peoples making claim to the same piece of ground. The struggle is a violent struggle. Israel suffers from Palestinian homocide/suicide bombers and rocket attacks targeting the civilian population. Multiple times, international financial and political resources have been injected, but in the end, the result has been and continues to be failure. But they didn't capture these territories from Yasser Arafat. They captured them from Jordan's King Hussein. I can't help but wonder why all those Palestinians suddenly discovered their national identity after Israel won the war. Palestine has never existed -- before or since -- as an autonomous entity. It was ruled alternately by Rome, by Islamic and Christian crusaders, by the Ottoman Empire and briefly by the British after World War I. The British agreed to restore at least part of the land to the Jewish people as their homeland. To think that it is the Palestinian-Israeli conflict that has brought violence to the Middle East, would be grossly wrong. For violence was an integral part of the Middle East long before the start of the modern Palestinian-Israeli conflict. Efraim Karsh writes that it always has been that in the Middle East among the Arab Nations. The Israeli-Palestinian conflict did not bring violence to the Middle East. The violence mental set was already there among the Arabs. What is clear to us is that the Mideast Crisis and the suffering of the people of Israel cannot be solved by any political process, any treaties or agreements with the Palestinians no matter how guaranteed, any military interventions, or any clever financial incentives designed to get people to cooperate, be civilized and build civilized institutions. is the manner of two people who struggle to overthrow each other that one embraces the other and knots him with his arms. There are three ways to destroy Israel: one is to kill all the children of Israel, the second is to embrace Israel so that Israel becomes assimilated and indistinguishable from the rest of society. The third way is to tie it and constrain it so that Israel loses its freedom. Historically, in different cultures and in different times, these three ways have been attempted repeatedly. 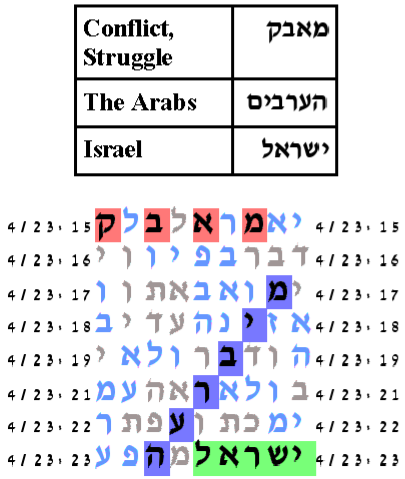 The struggle, מאבק, involves Israel, ישראל. 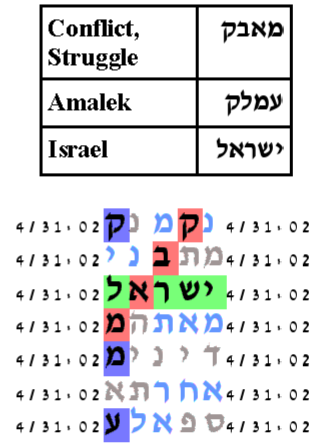 For the one who struggles with Israel, we have three possibilities: Ishmael, ישמעאל, the Arabs, הערבים, and Amalek, עמלק. We will form the most compact table with each and determine the statistical significance. With the expected number of ELSs set to 10, the probability that a text from the ELS random placement text population would have as small an area table as the one produced by the Torah is 6/1000. With the expected number of ELSs set to 20, the probability that a text from the ELS random placement text population would have as small an area table as the one produced by the Torah is 15.5/10,000. With the expected number of ELSs set to 100, the probability that a text from the ELS random placement text population would have as small an area table as the one produced by the Torah is 49/100 and is not statistically significant.